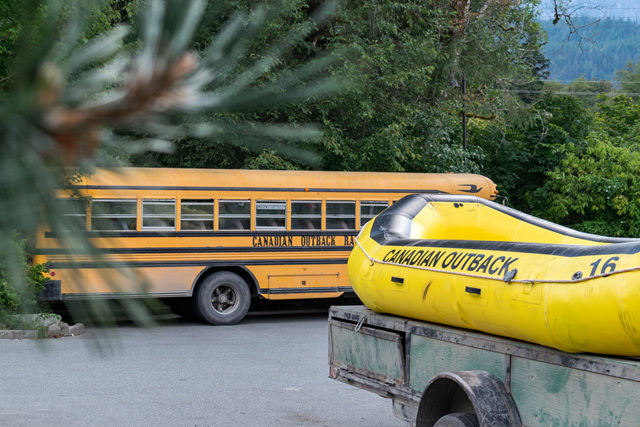 If you’ve ever been to Squamish you’ll agree that there is no shortage of activities to do in the summer. 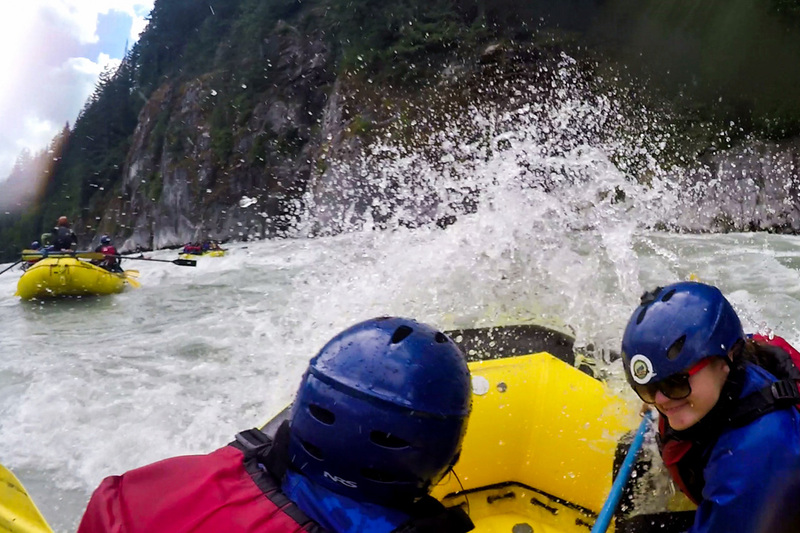 From the third week of April until the end of September, Canada has prime white water rafting conditions. This is especially true in British Columbia, focusing on Vancouver, Whistler and of course Squamish. The town of Squamish was created around the main rivers which flow from the melting snow on the Coast Mountains, meaning the water is a chilly three degrees. So fresh and pure you can drink straight from the source itself. White water rafting is an activity a variety of ages can enjoy. It is the perfect adventure for families as there are rivers with weaker level 1-2 rapids. Rafting is also popular for team building and for someone like me who joined the trip solo. The Canadian Outback Rafting Company team and my fellow raft-mates were all so welcoming and really made me feel a part of the group. I joined their Wet & Wild Elaho Exhilarator rafting trip which is one of the Canadian Outback Rafting Company’s more popular excursions. The day began at the Executive Suites Hotel & Resort where we checked in and met under a shaded picnic area out of the hot summer sun. As the group grew greater so did the anticipation. After everyone had arrived and settled we were greeted by JC who enthusiastically gave us a quick rundown on how the day would go and what we could and couldn’t bring with us. I recommend you wear your bathing suit ready to go. If you feel you may need extra layers, wear something tight and quick drying for underneath the wetsuit. Avoid cotton as this will make you colder. If you do this don’t forget to pack an extra set of dry clothes for afterwards! JC took us through the order in which we needed to collect the clothing and accessories from the staff. I was sure I would forget something but the staff were more than happy to help out. Pointed in the direction of the change rooms, we picked up water booties and a wetsuit and wriggled into both. On the way out we each picked up a wetsuit jacket, helmet, life jacket and an optional outer jacket which I suggest you take as it’s much easier to cool down on the river than warm up. I opted for the helmet with the GoPro attachment so I could get some great footage. 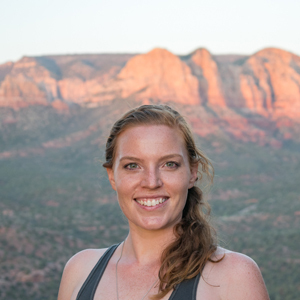 If you don’t have a GoPro, the Canadian Outback Rafting Company have some for rent and also a photographer who follows you down the river so you won’t miss out on taking home those awesome memories. I felt perfectly safe leaving my belongings in the change room as it is locked when the tour leaves. If you do have valuables you’re concerned about, either leave them at your accommodation, hidden away in your car or in the secure box provided which is locked in the locked change room for extra security. Bring some snacks and a water bottle for after the rafting as you will have built up quite an appetite. Keep in mind whatever you bring may roll around on the bus as it follows you down the river. All geared up feeling like rafting warriors we loaded ourselves in to the classic yellow school bus and were on our way to the launch site. The hour long bus ride was an adventure in itself. Consisting mainly of a bumpy logging road, we spent the time getting to know each other by standing up, introducing ourselves and stating a fun fact. I’m actually a very shy public speaker so was quite nervous in the lead up to my turn, but the staff and passengers were all so supportive of each other I had no trouble. Even though the ride was long it was enjoyable as the crew all had an infectious sense of light-hearted humour to keep us amused. At the launching point you will have an opportunity to use nature’s bathroom among the trees. We then were all given a paddle, split up in to teams of 7-8 people and given a quick but serious briefing by JC while the staff unloaded the rafts. I was introduced to my raft guide, Will, who has been with the company 7 years. Calmly and confidently he took our group through the detailed safety demonstration and showed us the commands we needed to know to get ourselves down the river. They were simple to understand but we practiced until we executed them seamlessly. It was then time to push off from the shore and begin the adventure. The start of the river is slow so we had time to all become confident with our “feet-belt” positions and paddling techniques. At the beginning there was a lot of nervous energy in our boat so Will drilled us until he was confident that we were confident. After the first set of rapids we were more in sync with our paddling and had the commands solidly ingrained in our minds. Will explained that he couldn’t take us through the bigger rapids unless we were sure of our strength and our skills. I was disappointed to hear that but also happy as it reassured me that they take their job and our safety seriously. Before we approached the bigger rapids it was decided we should make sure our wetsuits were working properly so a few of us volunteered to jump in the river. Even though it was three degrees it felt warmer in the wetsuit gear than most of the lakes I’ve swam in around Squamish. 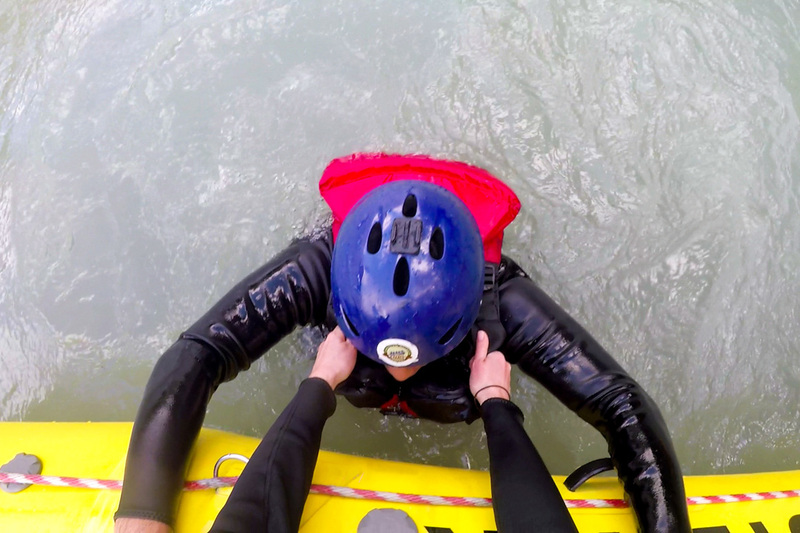 It was a good opportunity for us to practice our raft-buddy saving skills in case one of us did actually fall out. I quickly warmed up afterwards with the energy used to paddle and the summer sun. As we navigated our way down the Elaho River, we challenged rapids big and small. The larger rapids were exhilarating and on the smaller ones we had a chance to have some silly fun. Will let me sit on the front of the raft as they spun it in 360’s, and other raft-mates also had a chance at taking the prime seat as we went over some larger waves. Each raft was doing their own thing. Behind us I spotted everyone having a great laugh as they were standing up while floating over the small rapids trying to keep their balance. During the quiet moments we all got to know each other, Will included, and humorous stories were shared. Everyone asked plenty of questions about the vegetation and wildlife in the area. Will’s knowledge of the river and history of this incredible place was impressive. I felt a certain calmness floating down the river and wasn’t the only one. One of the other passengers was sitting with her eyes closed. It looked as though she was taking in the quiet and peacefulness of the ride while feeling the skin on her face soak up the warm summer sun. It was effortless to appreciate the absolutely breath-taking surroundings. Halfway down the 16km journey in a quiet patch we enjoyed a quick snack and ice tea. We also sampled the crisp glacier water from the river which was beyond refreshing. I adored viewing the majestic mountains from a new perspective, passing the very base of the mountains was so grounding. We drifted by the weeping wall just as the sun was bursting through the clouds which lit up the hundreds of feet worth of water cascading down the rock face. When in view, we were pointed out the dormant volcano hiding in the clouds in the distance. I caught sight of a soaring eagle in the sky above, and was told that it’s also possible to see beavers, bears and deer which frequently drink from the river’s edge. When the river expedition came to an end, we collectively loaded the rafts back on to the roof of the bus and made our way back to base at the Executive Suites Hotel & Resort. 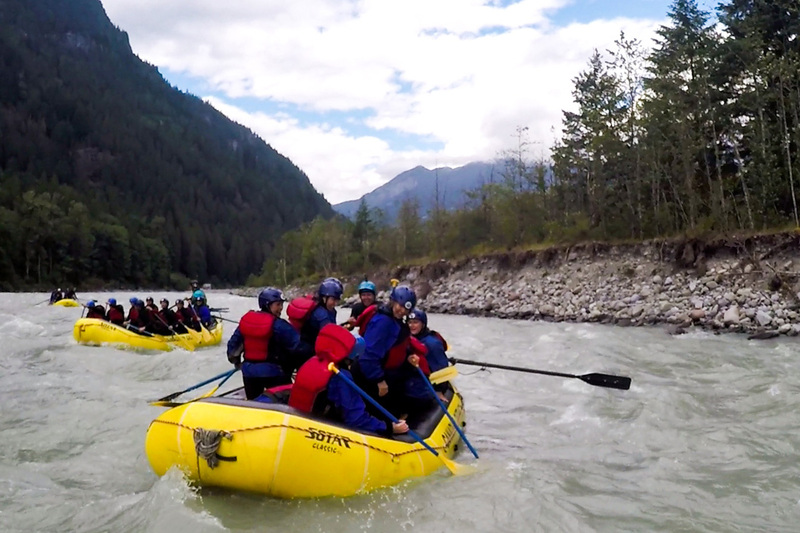 The staff came from all corners of the world but shared an enthusiasm for life and rafting. Full of energy and humour, they made the experience effortless with their organisation which minimalised the time we spent waiting around. They understood we would be hungry and cold after the experience so made it their priority to get us back to our belongings promptly. The staff provided fleece jumpers for those that were feeling cool on the bus. Once back at the base we changed back into our warm comfortable clothes and enjoyed a meal at the restaurant and a drink on the outdoor patio area. For those who were in a hurry, there was popcorn and water waiting for us to devour while we looked through our GoPro photos, shared a final laugh and had the chance to purchase the video footage and images. I arrived back home a little tired but adrenaline filled with plenty of stories and photos to share. 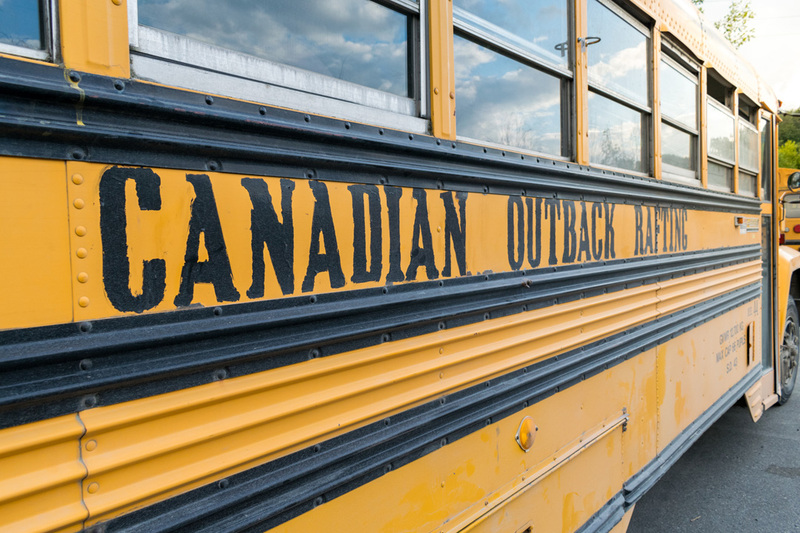 I was so impressed with the Canadian Outback Rafting Company’s professionalism and friendliness that I wouldn’t hesitate to take another trip with them again. All of the team members had great personalities with a sense of humour but knew when to be serious to keep our safety asa priority at all times. Interested in having your own rafting adventure, book it here! 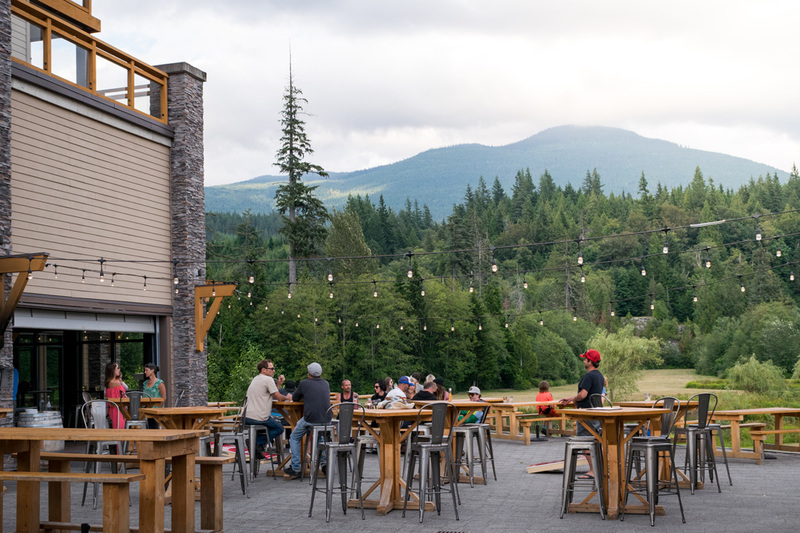 Planning a trip to Squamish? booking.com has over 3600 properties in British Columbia including hotels, apartments, and hostels. You get free cancellation on most rooms and a best price guarantee. I was provided with this tour in return for my honest review. All thoughts and opinions expressed in this article are my own and not influenced by the company. Rafting there looks like so much fun! Definitely a must do on my next trip out there! Looks like a blast. I’ve never been to that part of the world, but am planning a trip in the next year so I will definitely add some white water fun to my list! That’s fantastic, I’m glad you had such a great time with them! Amazing! Keep an eye out on here for more posts!